Ice Skating in London is a time-honoured tradition that has been drawing in the crowds since the world's first artificial ice rink (known as a Glaciarium) was unveiled in Chelsea in 1876. Nowadays, taking to the ice surrounded by the capital's magnificent historical architecture is a fabulously festive must. In recent years the rink at Somerset House has dominated the skating scene but there are loads of other skating facilities all over the capital, including the Tower of London and the Natural History Museum, as well as Hyde Park's magical Winter Wonderland. An urban apres skate bar and London's first rooftop ice rink. 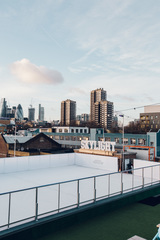 From 1st November 2018, Skylight gets a winter makeover with rooftop ice rink, cosy igloos and huts on top of Tobacco Dock . The winter season brings heated apres skate bars, draped in glimmering lights, serving warming winter cocktails, mulled wine as well as beers and ciders. Set on the top three levels of a former car park in Wapping, the 600 capacity Skylight has multiple bars, indoor and outdoor seating areas, and two street food stalls, all set against some of the finest views in the city - you can see The Shard , The Gherkin and the Walkie Talkie from here. Food wise, Raclette Brothers are bringing their signature Alpine treats with copious amounts of melted cheese and Yiro return with a seasonal menu. DJs, seasonal events and parties add to the offer with New Year's Eve celebrations sponsored by Moet et Chandon and a Burn's Night Ceilidh in January fuelled by Monkey Shoulder whisky drinks. On the 7th floor of John Lewis there's a rooftop ice rink overlooking Oxford Street. Following on from the Summer of Sound on the Roof, John Lewis turns the rooftop above its Oxford Street store into a winter hideaway. The 7th floor space has undergone a complete makeover, serving posh hot gin drinks - it's sponsored by Sipsmith - and, for the first time ever, it has a Skyline Skating rink. Book in at one of two 'Hideaways' to enjoy mulled sloe gin and hot G&Ts as well as Scotch eggs, sausage rolls and hearty food by MYPIE. Rooftop gin masterclasses tell of the famous frost fairs of days gone by, inspiration for the juniper-filled cocktail making masterclass. Background Bars are also in residence, serving winter themed tipples and mocktails to warm up from within, including a mulled apple punch and a chamomile fizz. Skate yourself dizzy against the spectacular backdrop of Somerset House. The grand 18th-century courtyard of Somerset House makes for a spectacular backdrop for one of the most popular ice rinks in town. Skating around under the 40-foot Christmas tree with a hot toddy to keep out seasonal chills is one of London's most appealing winter rituals - and a superb way to ease yourself into the festive spirit. If your youngsters need guidance there's the Polar Cub Club for under 8s. But if you're looking for something altogether more grown up, Skate Lates brings a specially curated programme of music to the rink on nights with takeovers from hot names in the contemporary music scene. Get your Christmas shopping done while you're there at The Christmas Arcade, a pop-up version of Fortnum & Mason's occupying 15 rooms in the West Wing of Somerset House filled with hampers, tea caddies, stocking fillers, gifts and games. 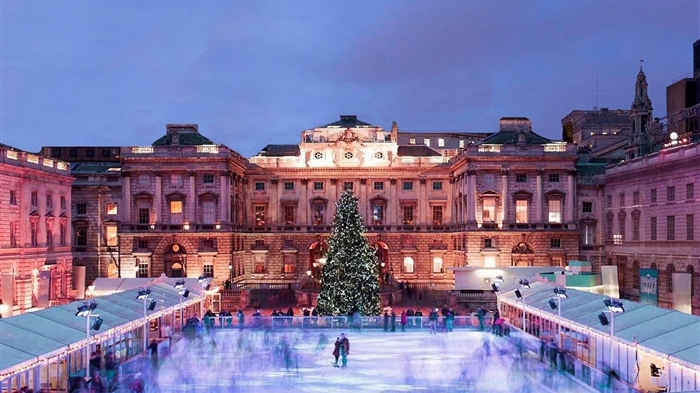 Now in its 19th year, Skate at Somerset House truly is "one of the great sights of a London winter... a wonderful place to be" (The Times). The first ice rink to come to Clapham Common. Melanie C kicks off the festivities at South London's answer to Winter Wonderland as Winterville returns to Clapham Common for 2018. The sporty one will be DJing her 90s Mixtape in the Spiegeltent where there's a huge musical lineup from the likes of Norman Jay, Soul II Soul's Jazzie B, The Cuban Brothers and DJ Yoda. Basically, it'll be a big old party every Friday and Saturday night, and all for FREE! Also on site are Street Feast, the ice rink, Twisted Wheels Roller Disco, Plonk Golf, the fairground and pop-up pub Bar Humbug. Backyard Cinema introduce The Christmas Labrinth, a huge magical maze which leads to a two-screen cinema in an enchanted forest with a cabaret-themed bar and a hidden tequila bar. Aerial sensationalists Chivaree Circus debut their brand-new production CRASH in the Spiegeltent. And for the first time the Winterville Spiegel hosts comedy with a special showcase of Rabbit Rabbit Comedy's favourite comedians including Kerry Godliman, Fin Taylor and Tony Laws. There's everything from Mexican wrestling to Mighty Hoopla with family fun in a converted double decker bus as Bus King Theatre stages magical puppet show What Is That In My Hat? One of London's largest ice rinks returns for 2018. One of London's largest ice rinks, the Ice Rink Canary Wharf is back for Christmas 2018 and it's bigger than ever. Open seven days a week, the 12,000 square metre rink is set beneath twinkling lights in Canada Square Park. For those who prefer to watch on as others do the gliding, there is a large heated outdoor viewing terrace and bar from where you can admire the icy action. The Natural History Museum's massive ice rink comes complete with twinkly lights and hot chocolate. The earliest of London's winter ice rinks to open, the Natural History Museum's annual icing-over of its gardens kicks off from 25th October. The 1,000 square metre rink outside Alfred Waterhouse's imposing building is surrounded by 80,000 glowing pea-lights dangling from the overhanging trees and a sparkling 30 foot Christmas tree. Additional attractions include a smaller 100-square-metre rink for youngsters and a stylish balcony cafe/bar when you can warm your hands and insides on hot chocolate. Big-foots amongst you will be pleased to know that skates go up to adult size 15, while penguin skate aids are available for £5 on a first come first served basis. Hyde Park's Winter Wonderland is home to the biggest outdoor ice rink in the UK. Don your skates and glide around the glittering ice rink that is set within Hyde Park Winter Wonderland around the Victorian bandstand and illuminated with over 100,000 lights. It claims to be the UK's largest outdoor rink and at 1,600 metre squared it might well be. Live music plays as skaters take to the ice for a spin and those in the giant Observation Wheel next to it get a bird's eye view of the skaters below. Both are part of the annual Hyde Park event which takes place throughout late November and December bringing fairground rides, a giant wheel, Zippos Circus, a Christmas market, food and drink stalls, Santa's grotto and, of course, the ice rink to this corner of Hyde Park for the holidays. Head to Hampton Court Palace for a festive skate with an unbeatable view. For a truly regal skating experience London has to offer this winter, head to the Hampton Court Palace Ice Rink and take to the ice at Henry VIII's former home. The striking Tudor facade of Hampton Court Palace provides a majestic backdrop to this popular open air ice rink. Located in front of Henry VIII's historic home, the ice rink - measuring more than 1,000 metres square - affords sweeping views of its breathtaking architecture and is easily accessible by train from central London. Sessions last an hour and weary skaters, axel-ed out, can recharge at the adjacent food stalls serving hot refreshments. The palace itself is adorned with festive decorations at this time of year and it's worth leaving extra time to take a look inside or explore the maze. It's enchanting stuff that will undoubtedly leave you with that warm festive glow. Skate in the famous moat surrounding the iconic royal palace. Nestled in the rounded hollow of the dry moat, the Tower of London's ice rink area forms a wonderfully festive scene. An ideal winter activity for children, couples and friends alike, visitors can carve their route across the ice while taking in one of the most historical buildings in London. Besides the Ice Rink there are pop-up food and drink stalls too, and a programme of events to be announced soon. While you're here it's worth paying a little extra to explore the murky history of the Tower of London too. For guaranteed snow this Christmas, head to this west London ice rink. If you're looking for guaranteed snow this Christmas head to QUEENS Skate Dine Bowl, where custom made snow cannons will create a winter wonderland on the ice rink. There will also be sing-a-long session on the ice every Saturday, with the chance to put your touch on the nation's favourite Christmas classics. Additionally, The Sin Bin, presented by MEATLiquor, will be London's only dedicated curling rink side bar and diner offering guests the chance to refuel, recharge and relax after taking to the ice. A special XXXmas menu will feature pigs in blankets, a roast turkey burger and a turkey cheese stack. From cheap budget hotels to luxury 5 star suites see our deals for hotels, including Club Quarters Gracechurch from 53% off.